Hi, my name is Melissa Tobin. I am from southern California, specifically Los Angeles County. My family and I moved to central Ohio my senior year of high school. I graduated from Granville High School and decided to attend The Ohio State University at Newark. I choose this campus because I did not want to move again after just moving across the country, and I knew that smaller class sizes work best for me. Ever since I started college people always ask me why I left California or why I would ever want to leave. My mom’s job brought us across the country, and it was my mom’s job that moved my family again just before I started college. I am in my fifth year on the Newark campus and I am majoring in psychology and minoring in professional writing. It took me some time to figure out what path I wanted to pursue; eventually, I was able to figure it out with some help from my family. I plan to continue on to graduate school with a focus in counseling. I would like to find a job as a counselor in the military. I am interested in becoming a counselor in the military because I have always enjoyed helping others and several members of my family have served in the armed forces. Cutting wood for the Habitat for Humanity build in Alabama. I am the vice president for the Campus Activities Board student organization and I am a team leader in the Adena Recreation Center. 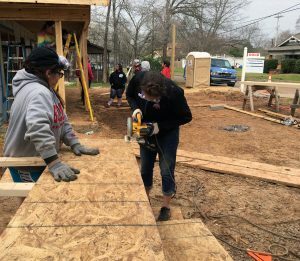 I was a part of the Habitat for Humanity Collegiate Challenge for two years where we traveled to Georgia and Alabama during spring break, Naps Against Poverty where we held clothing drives to collect and give to children in need, and Active Minds where we helped bring awareness to mental disabilities. My college experience has been more enjoyable since I have become involved on campus through work and student organizations. I have participated in many opportunities where I have met many students, faculty and staff, and I have made great friends. When I am not busy on campus with school, work or student organizations, I enjoy spending time outside, a love that I developed while growing up in Southern California. When I am relaxing on campus, I am usually in the Warner Center with my friends.